Are you nervous about going to the dentist? You’re not alone. About half of Americans say they’re anxious about visiting the dentist, and almost 10 percent are so afraid, they put off needed dental care. Thurm Dental is proud to offer sleep dentistry to provide a safe, anxiety-free dental experience for people who are afraid of the dentist. Whether you’ve had a bad experience previously or simply have a phobia of the dentist, we can make sure you feel completely relaxed and comfortable. Best of all, we can typically fix years of neglect in just one or two visits. Call us today at (856) 335-1775 to schedule your appointment. Sleep dentistry is a form of sedation dentistry that uses general anesthesia. 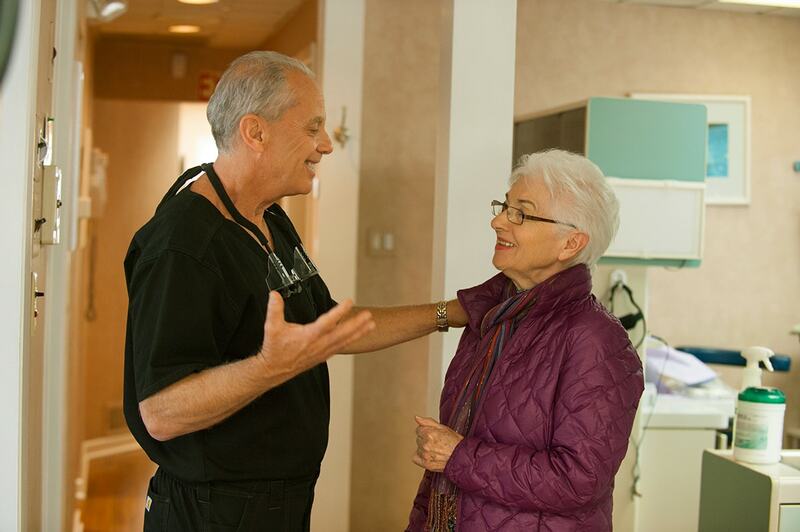 Dr. Arthur Thurm is one of the only dentists in the area who is certified in general anesthesia for general dentistry. Other dentists in New Jersey, Philadelphia, and Delaware often refer patients with dental phobias, special needs, or dementia to our office so we can treat them with comfortable, compassionate care. With sleep dentistry, the patient just needs to lie back and relax while our qualified team administers general anesthesia or IV sedation to put the patient completely sleep. The patient will be completely pain-free and will have no memory of the experience. The patient simply wakes up when the dental work is complete. Our team will be happy to discuss your particular needs either on the phone or at the time of your first consultation. People come to Thurm Dental every day to eliminate toothaches or improve their smiles. One of the greatest benefits of sleep dentistry is that there are no shots, no pain, and no memory of the treatment. The patient simply sleeps during the procedure and wakes up with a new smile. Another reason why people choose sleep dentistry is that a lot of work can be completed in just one visit. That saves the patient a lot of time. Sleep dentistry also makes the visit less stressful for the patient. By having a good experience at the dentist, the dental phobia may be reduced and it is often easier to return for regular dental care in the future. The first step to looking and feeling better is to schedule a consultation with Dr. Arthur Thurm. During your first visit, Dr. Thurm will answer all of your questions, including whether sleep dentistry or another type of sedation dentistry is most appropriate for you. Call us today at (856) 335-1775 to schedule your appointment.